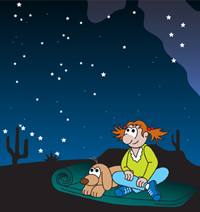 Learn more about meteor showers! If it's time for a meteor shower, you won't need a telescope, binoculars, or a high mountain to have a "star gazing" party. You might need a warm sleeping bag and an alarm clock to wake you in the middle of the night. But then just lying down in your own back yard will put you in the perfect spot to enjoy a great show. Why would Earth encounter many meteoroids at once? Well, comets, like Earth and the other planets, also orbit the sun. Unlike the nearly circular orbits of the planets, the orbits of comets are usually quite lop-sided. As a comet gets closer to the sun, some of its icy surface boils off, releasing lots of particles of dust and rock. This comet debris gets strewn out along the comet's path, especially in the inner solar system (where we live) as the sun's heat boils off more and more ice and debris. 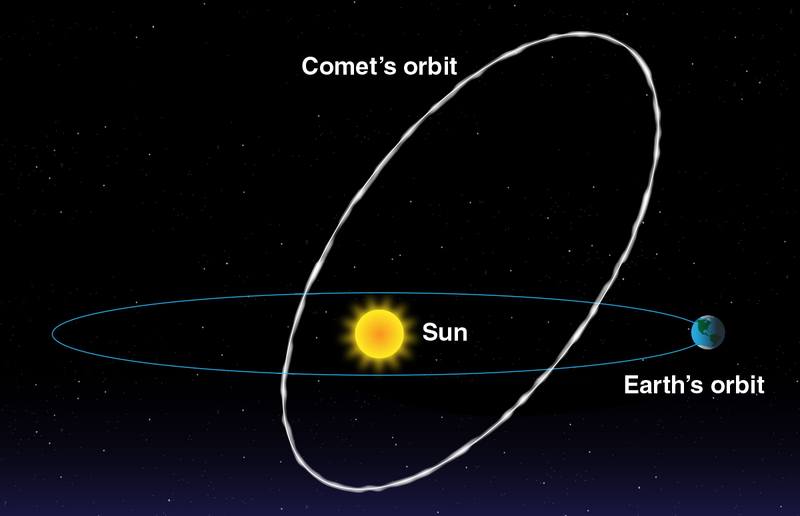 Then, several times each year as Earth makes its journey around the sun, its orbit crosses the orbit of a comet, which means Earth smacks into a bunch of comet debris. In the case of a meteor shower, the glowing streaks may appear anywhere in the sky, but their "tails" all seem to point back to the same spot in the sky. That's because all the meteors are coming at us at the same angle, and as they get closer to Earth the effect of perspective makes them seem to get farther apart. It's like standing in the middle of railroad tracks and seeing how the two tracks come together in the distance. Meteor showers are named for the constellation where the meteors appear to be coming from. So, for example, the Orionids Meteor Shower, which occurs in October each year, appear to be originating near the constellation Orion the Hunter. Here are dates of major meteor showers. Peak viewing times will vary by a day or two each year. Keep in mind: If the moon is full or near full, you may not see many meteors. Some years are better than others for numbers of meteors per hour. For more information, visit the NASA Solar System Exploration meteor and meteorite page. 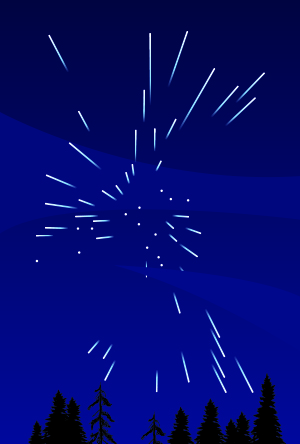 Have a shooting star party! Bring blankets, a sleeping bag, and a thermos of something warm to drink. Hot chocolate, perhaps? Lie down and get warm and cozy. Let your eyes relax and try not to look at any particular spot. This way, your eyes will be more likely to notice any movement and you will see more meteors this way. Most importantly, be patient! If you are lucky, you might see a meteor as often as every few minutes. You may not see one that often. The quality of the "show" depends on the specific meteor shower, the time you are observing, the conditions of the sky, the phase of the moon, and other things.